It was a moment that many young athletes dream of: playing under the lights at an NFL stadium for a championship with their best friends and teammates. It was a cold, snowy night in December at MetLife Stadium (home of the New York Giants), and we were playing for the New Jersey High School State Championship. Weighing in at 165 pounds, I knew it was a tough matchup against our much bigger rivals, Mountain Lakes. Friends, family, and loved ones lined the stands to cheer us on despite the freezing temperatures. As I walked out for the first play, I remember looking up and thinking, “Is this real life? Are we really playing on the same field that the New York Giants play on right now?” That realization hit me—literally—on the first play of the game. Mountain Lakes was known for having the biggest team in the area—a 215-pound running back, 275-pound lineman, and a scrambling quarterback who went on to play for a top Division I college. I remember it as if it were yesterday. The first play of the game was a toss to the left. Lined up at safety, I watched the play develop as our defensive end, linebacker, and cornerback all got blocked. The only one left to make the play was me. . . In my mind it was feasible. I had made plenty of tackles during my career, so this one should have been no different. As I lowered my shoulder pads to try to deliver a hard hit, and send a message to the running back–WHAM! The next thing I knew, I was lying on the ground, looking down the sideline as the running back ran into the end zone for a touchdown. Not only was I confused as to what had happened, but I very quickly realized something wasn’t right. My entire left shoulder was numb, and I couldn’t feel my right leg. Fortunately, my teammates helped me off the field to go see our athletic trainer. It wasn’t until I was on the sideline that I found out not one, but two of the 275-pound lineman came around and blocked me from the side to spring the running back into the end-zone. Needless to say, I was hurting bad, and the game had just begun. Our trainer looked at me and said, “You have two options: either you can come out of the game, and we can get you rested for basketball season, or we’ll do what we can to make sure you finish out this last game.” No brainer. Five minutes later I turned into a science experiment—a wrap extending from my shoulder, down around my leg and knee, in order to keep me functional. I had torn my MCL, received a bad stinger, and, without a doubt, suffered some serious head trauma from the hard-hit straight on the ground. Ten aspirin later, a correct guess at some fingers he was holding up, and I made my way back out on to the field. We ended up losing that game by a large margin (it was an amazing experience, nonetheless). I planned to be sidelined from basketball (the season started the following week) for several weeks after, in order to rehab my MCL, but that wasn’t even the major setback for me. At the time, no one knew that I could hardly sleep at night, had constant headaches, and frequently left class due to nausea and vomiting throughout the next week. Looking back, there is zero doubt that I had a concussion/mild TBI following that game. In fact, there is no doubt that I suffered multiple brain injuries throughout my short-lived career, but this was by far the most memorable for me. The reason for this article isn’t to re-live the glory days and talk about some of my high school memories, but rather to talk about how quick and easy it is to get a brain injury/concussion, how easily it gets overlooked, and, knowing what I know now, how to determine if I could have done anything differently. For anyone who knew me in high school, I was the biggest “carb-aholic.” I ate 4 bowls of cereal for breakfast (usually Lucky Charms or Captain Crunch), a cafeteria lunch plus a carb-filled weight gainer shake (I was trying to bulk up that 165-pound frame) and usually a nice Italian dinner at night (thanks Mom J). If time spared me, I would eat a sleeve of Oreos before bed…literally an entire sleeve. Thus, the concept of a ketogenic diet was nowhere near my radar nor had I ever heard, read, or seen anything even remotely close to the concept. At that time, the only answers I got from my doctors, my trainers, and even my parents were simple: rest and Advil. However, if I could go back and do it all over again, is there anything I would have done differently? 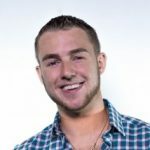 How could I take what I know now and let 17-year-old Ryan know that there might be a different way he could deal with that traumatic brain injury (TBI)? TBI is a leading cause of death and disability in infants (<2 years) and adolescents (15–18). Additionally, over 20% of pediatric patients who have suffered a TBI experience lifelong physical disabilities, such as “cognitive impairments with persistent attention, memory and concentration deficits as well as emotional disorders such as anxiety and depression, which can significantly influence academic and work performance and cause profound social dysfunction later in life.” The financial burden alone is alarming; The US spends about $1 billion per year just on pediatric TBI patients. Further, the NFL is expected to pay out well over $250 million (and counting) in their recent settlement with former players who are now experiencing long-term effects, or even chronic traumatic encephalopathy (CTE)– a progressive degenerative disease of the brain found in individuals with a history of repetitive brain trauma, including symptomatic concussions and asymptomatic sub-concussive hits to the head. Just recently, a study was published that looked at repetitive head impacts (RHI) and cognitive function in youth athletes. To put this in perspective, worldwide more than 22 million children and adolescents are exposed to RHIs in soccer alone. On average, soccer players perform 6–12 headers (a technique where the player uses the top of their head to move the ball down the field) per game and many more during practice, resulting in thousands of headers over a player’s career. This study looked at the cognitive function of a group of 15-year-old male soccer players throughout a season. They found that the players who performed the most long-headers had a lack of improvement in cognitive performance, and slower reaction time compared to their counterparts. Traumatic brain injury (TBI) occurs as the consequence of a direct or indirect mechanical force applied to the head. 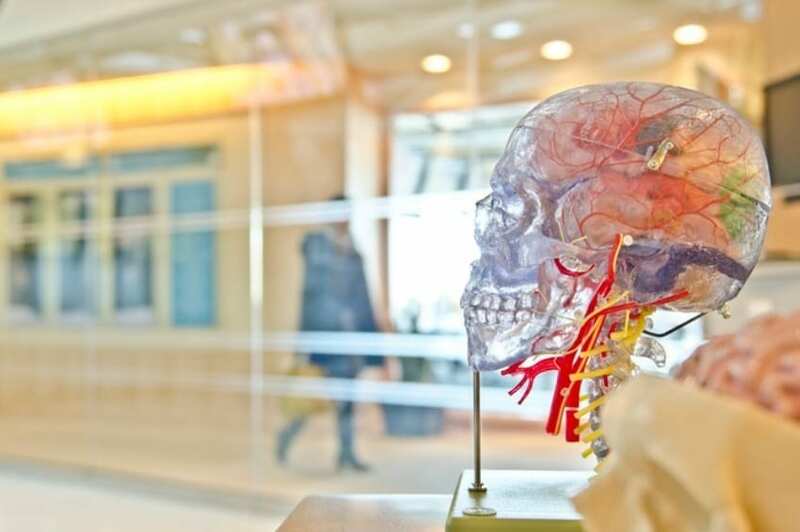 Following a concussion or blow to the head, there is an initial insult to the brain; however, many of the adverse effects we see may be caused by secondary injuries or events that take place long after the initial hit or insult happened. How could this be? Following a concussion, the brain has an increased demand for energy. This makes sense in that the brain is doing its best to increase energy uptake to recover and overcome the repeated blows or blow that it has taken. However, there is one slight problem. . .the brain also has an impaired ability to take up glucose during this time. Think about that for a moment. At the time when our brains need energy the most, we have an impaired ability to take up glucose to provide that energy. So what do you think happens? 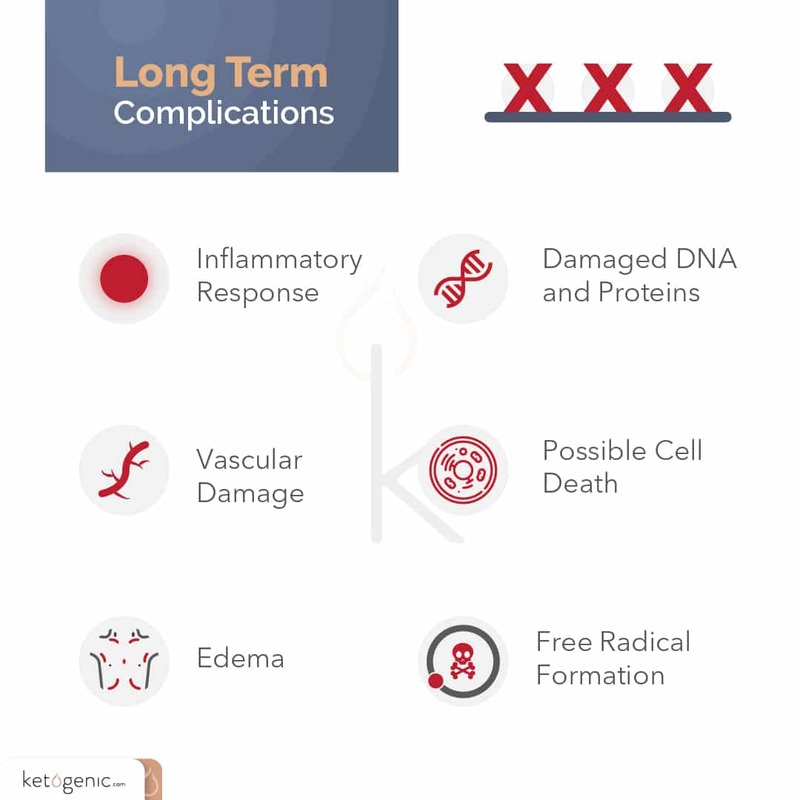 This is where those secondary or longer-term injuries can start to occur, such as inflammatory changes, vascular changes, edema (swelling), and even free radical formation, which can all lead to damaged DNA, proteins, and increased cell death. We should be able to rebound quickly after these insults, right? Not necessarily. In fact, after the initial injury period, brain glucose use is diminished for 24 hours and remains low for 5 to 14 days on average, and at times for months, depending on the severity of the injury. These levels of depressed glucose metabolism are strongly associated with cognitive impairments. 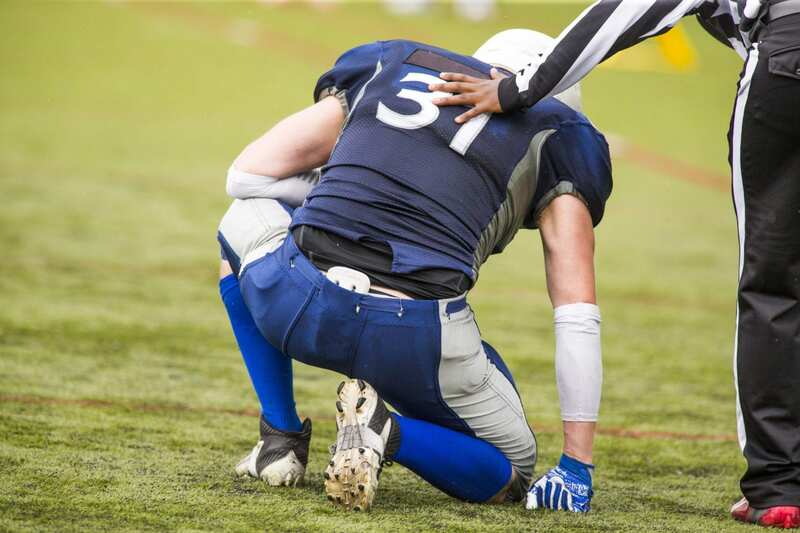 Clearly, our brains don’t enjoy dealing with these types of impairments and blows to the head that frequently take place in various sports and situations. The question becomes: can our body adapt to utilizing a different fuel source for energy during this critical time of need, or are we just stuck waiting on the “slow drip” glucose to try to make itself into the brain? TBI results in impaired brain energy metabolism. What if there was an alternative source of fuel that could be used during this time? In fact, what if our brains automatically increased the transporters necessary to take up more of this alternative fuel source during this dire time of need? There is an alternative source of fuel, and it is a fuel that our body is well equipped to use, yet we seldom allow it to do so. It is known that both rats and humans are ketotic when born, and therefore rely heavily on ketones for fuel. Thus, from the start, our bodies have the ability to take up and utilize ketones as a source of fuel. 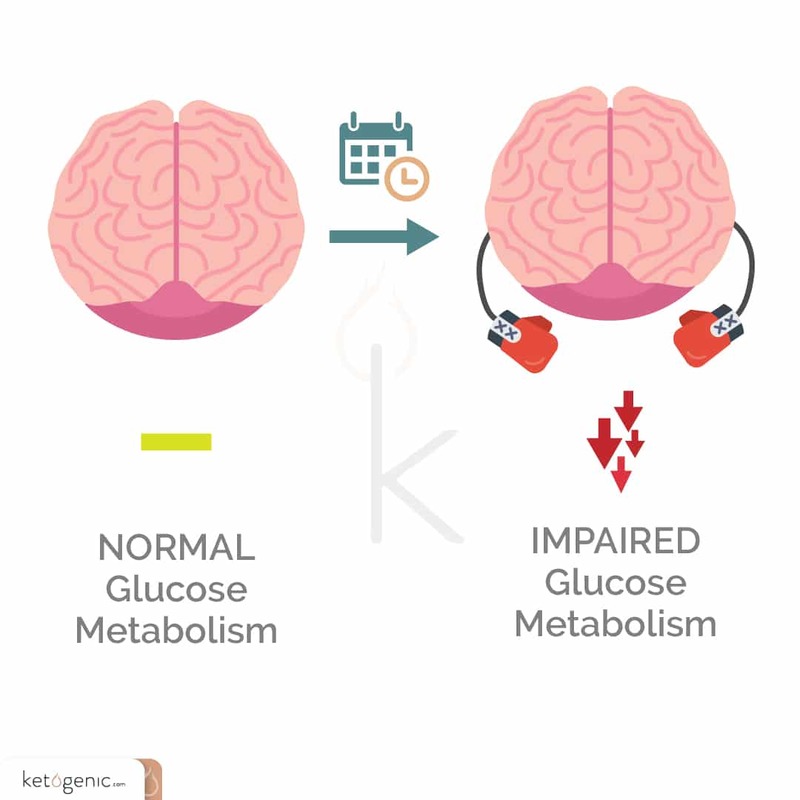 This means that there are certain transporters or tunnels that can take ketones into the brain and various other tissues for use during times of starvation, or when carbohydrate levels in the diet are low (e.g., during a ketogenic diet). However, as we age, it is possible that these transporters or tunnels decrease due to the nature of our diet (eating carbohydrate-rich foods, always snacking, etc.). Prins and Giza found that following a TBI, certain transporters (or tunnels) that take up ketones into the brain are increased. It is almost as if our bodies understand there is a need to get an alternative source of fuel to the brain. Thus, to help take up ketones for fuel, it is plausible that MCT2 tunnels become upregulated. Even though the transporters are elevated, many athletes and individuals tend to consume sugar-rich sports drinks or carbohydrate-laden foods, so it is as if tunnels are wide open but no cars are driving through (i.e., ketones aren’t going through the tunnel transporters). 1. Ketones provide an alternative fuel source to glucose, which can help overcome the energy deficit seen during trauma. Specifically, while glucose takes several enzymatic steps to move into the Krebs cycle of the mitochondria, ketones only require three steps. 2. Ketones can lower free radical production, first by improving mitochondrial function, and second by increasing antioxidant enzymes, which counter oxidative stress. 3. 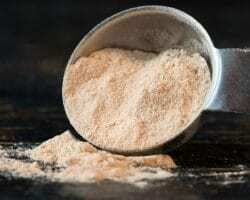 Ketones may improve mitochondrial function and number. 4. 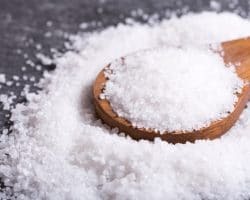 Ketones have been shown to lower inflammatory markers. 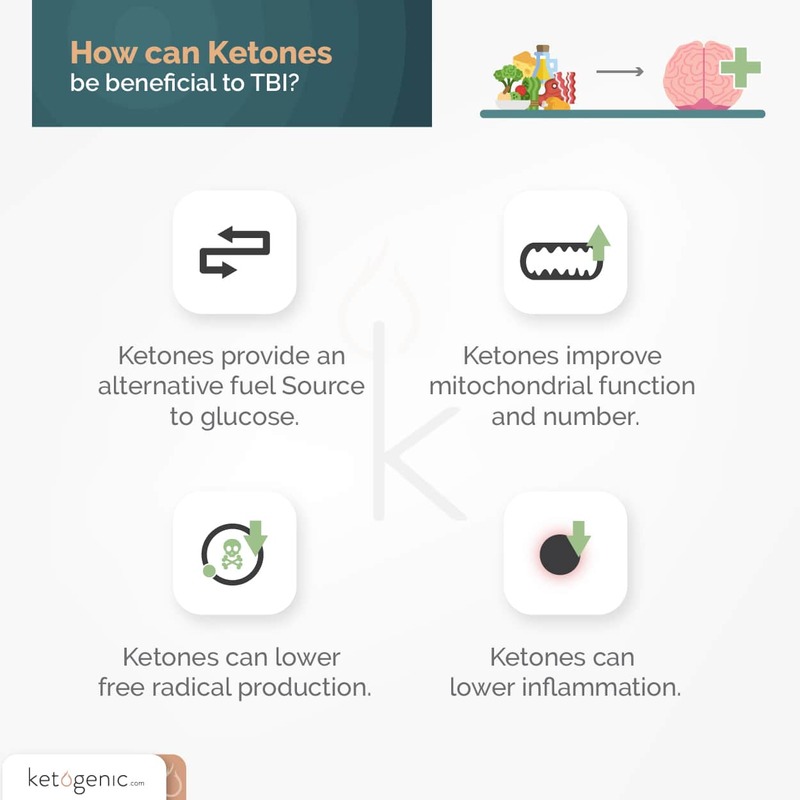 Back in the early 2000s, studies showed that infusing ketones (BHB) following a TBI in an adult rat resulted in improved ATP (energy) concentrations. 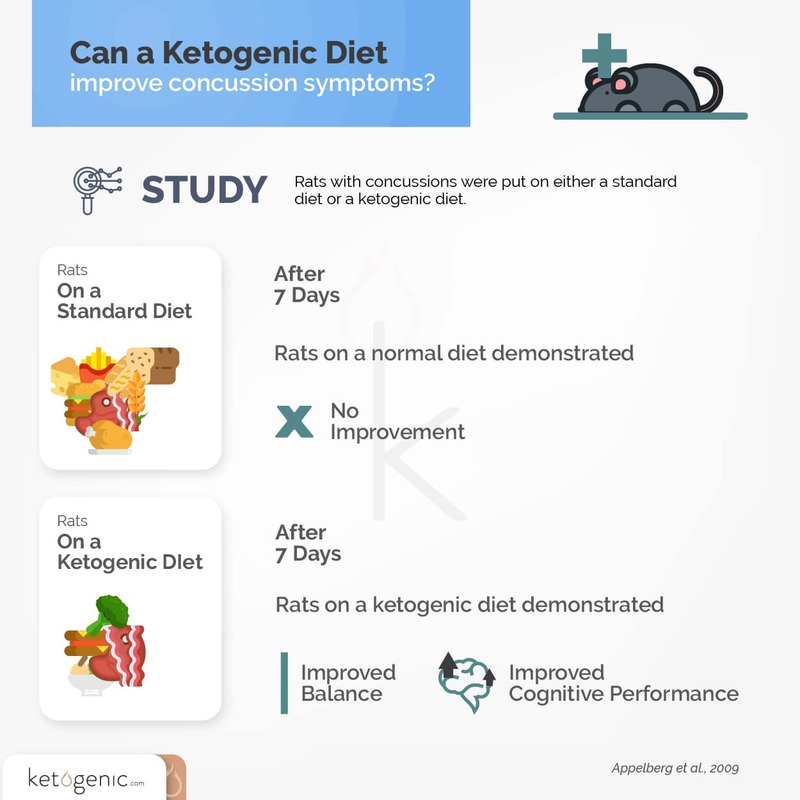 Future studies built on this work by placing adolescent and adult rats on a ketogenic diet either one week before, or immediately after experimentally induced TBI. The ketogenic diet decreased the size of the lesions in the brain, improved cognitive and motor function, and decreased cell death. 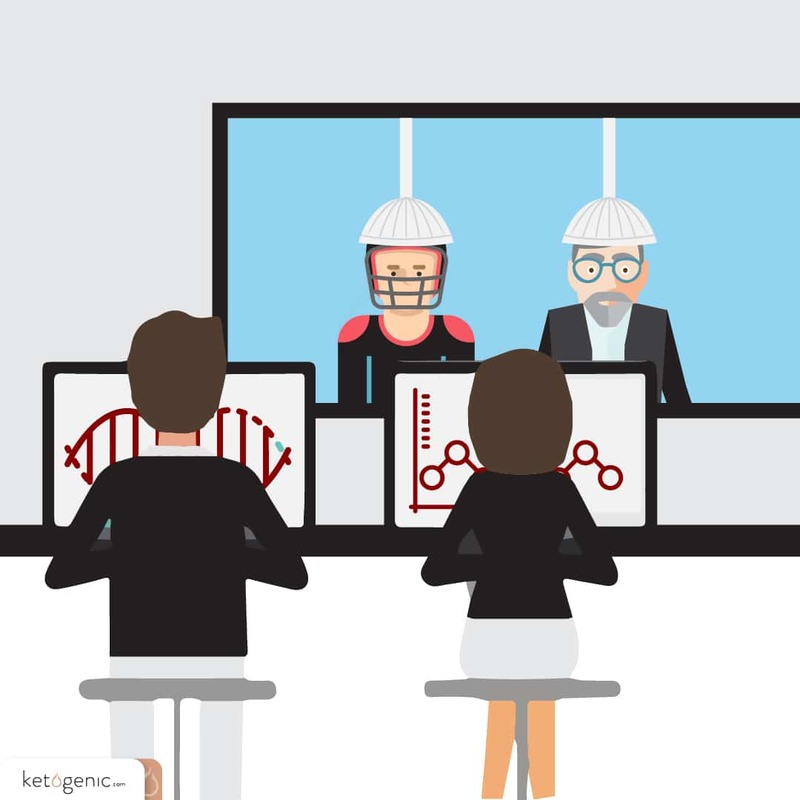 Without going into too much detail, there are differences between how younger and older animals responded, primarily because adolescent mice have been shown to have over 80% more of the ketone transporter proteins than older adults. However, studies have shown that exercise can actually increase these transporters, along with longer duration ketogenic diets. 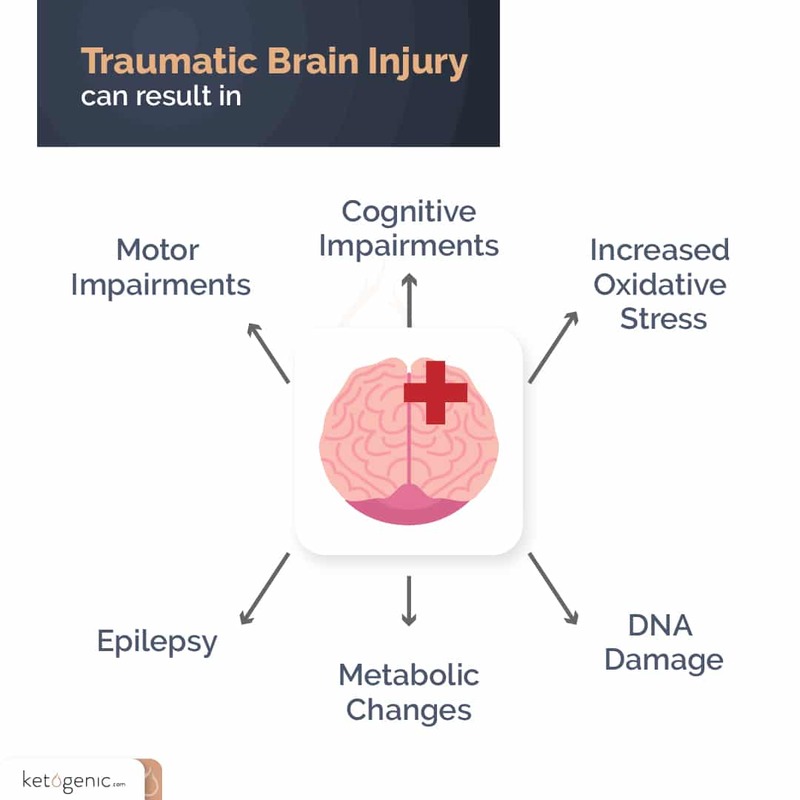 Therefore, it may be that as we get older, a combination of exercise, ketogenic dieting, periodic fasting, and exogenous ketones are necessary to elevate ketones to a level that is adequate to overcome the energy deficit after a TBI. By no means am I a medical doctor, nor do I intend to give medical advice. Instead, this is advice to my former self on what I would have done, now that I understand the research behind TBIs. 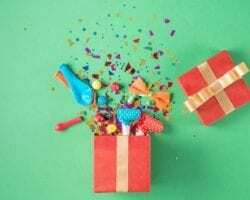 Had I known what I do now, I would have implemented some strategies to allow me to potentially overcome some of those rough days and weeks following that big blow. First and foremost, I would have been fasting. Studies have shown that fasting animals for 24 hours after a trauma resulted in a significant increase in tissue sparing (lowered oxidative stress), neuroprotection, cognitive function, and mitochondrial function. Additionally, I would have supplemented with exogenous ketones and done hyperbaric oxygen therapy during this time, had they been available. Ideally, I would have opted for one that was efficaciously dosed and elevated ketone levels to a point in which they could be utilized and taken up by the brain (being that there is a direct correlation with the number of ketones present in the blood and uptake in the brain). Lastly, I would have lowered my carbohydrate intake and gone on a ketogenic diet following the game, and incorporated periods of intermittent fasting. Ideally, this would have occurred prior to the trauma so that I would have been keto-adapted. However, my carbohydrate-addicted self would not have seen a reason why I needed to give up my morning cereal and Yoo-hoo prior to an incident like this. It is clear that a TBI results in an energy crisis in the brain and impairs metabolism immediately after, and for up to several months following the insult. Research suggests that correcting the energy crisis may assist in recovery from the insult, and may restore cellular energy to the brain. Adolescents placed on a ketogenic diet before and following injury may benefit tremendously; However, adults seem to require a longer period of time on the diet to increase the “tunnels” (MCT1, MCT2 transporters) and ketone production. As a protective measure, adults may need to keto-adapt for a longer period of time, even prior to receiving TBI. For this reason, it may be efficacious for athletes in contact sports to consider being on a ketogenic diet more permanently. If this is not the case, exogenous ketone supplementation and intermittent fasting strategies seem to be an incredibly viable option to aide in this regard. Research with TBI and other neurological disorders like Alzheimer’s, Parkinson’s, etc. all seem to tie back to impaired brain energy metabolism (primarily derived from an inability to effectively utilize glucose). The current rates of concussions and TBI in sports are certainly alarming, and no one is more aware of this problem than the NFL. The current NFL settlement is resulting in hundreds of millions, if not billions, of dollars being paid to former NFL players who have experienced brain trauma and are dealing with the repercussions, or as some call it, “life after the game.” There is a strong interest from the NFL in ways in which these injuries could be minimized prior to, during, and following the incidents. We are excited about some potential research and collaborations that we have been discussing with many of these organizations to test novel strategies in athletes in the near future. At the end of the day, if we could save just one player, one son, one father from something as brutal as CTE, then it is all worth it. 1. Omalu, B. I., DeKosky, S. T., Minster, R. L., Kamboh, M. I., Hamilton, R. L., & Wecht, C. H. (2005). Chronic traumatic encephalopathy in a National Football League player. Neurosurgery, 57(1), 128-134. 2. Aleksandra, I., Rodriguez-Grande, B., Bar, C., Villega, F., Konsman, J. P., & Badaut, J. (2017). Vascular impairment as a pathological mechanism underlying long-lasting cognitive dysfunction after pediatric traumatic brain injury. Neurochemistry International. 3. Koerte, I. K., Nichols, E., Tripodis, Y., Schultz, V., Lehner, S., Igbinoba, R., … & Kaufmann, D. (2017). Impaired cognitive performance in youth athletes exposed to repetitive head impacts. Journal of Neurotrauma, (ja). 4. Hovda, D. A., Fu, K., Badie, H., Samii, A., Pinanong, P., & Becker, D. P. (1994). Administration of an omega-conopeptide one hour following traumatic brain injury reduces 45calcium accumulation. In Brain Edema IX(pp. 521-523). Springer Vienna. 5. Barkhoudarian, G., Hovda, D. A., & Giza, C. C. (2011). The molecular pathophysiology of concussive brain injury. Clinics in sports medicine, 30(1), 33-48. 6. Cotter D. G., d’Avignon D. A., Wentz A. E., Weber M. L., Crawford P. A. 2011. Obligate role for ketone body oxidation in neonatal metabolic homeostasis. J. Biol. Chem. 286: 6902–6910. 7. Prins, M. L., & Giza, C. C. (2006). Induction of monocarboxylate transporter 2 expression and ketone transport following traumatic brain injury in juvenile and adult rats. Developmental neuroscience, 28(4-5), 447-456. 8. Veech, R. L., Chance, B., Kashiwaya, Y., Lardy, H. A., & Cahill, G. F. (2001). Ketone bodies, potential therapeutic uses. IUBMB life, 51(4), 241-247. 9. Ziegler, D. R., Ribeiro, L. C., Hagenn, M., Siqueira, L. R., Araújo, E., Torres, I. L., … & Gonçalves, C. A. (2003). Ketogenic diet increases glutathione peroxidase activity in rat hippocampus. Neurochemical research, 28(12), 1793-1797. 10. Youm, Y. H., Nguyen, K. Y., Grant, R. W., Goldberg, E. L., Bodogai, M., Kim, D., … & Kang, S. (2015). The ketone metabolite [beta]-hydroxybutyrate blocks NLRP3 inflammasome-mediated inflammatory disease. Nature medicine, 21(3), 263-269. 11. Massieu, L., Haces, M. L., Montiel, T., & Hernandez-Fonseca, K. (2003). Acetoacetate protects hippocampal neurons against glutamate-mediated neuronal damage during glycolysis inhibition. Neuroscience, 120(2), 365-378. 12. Biros, M. H., & Nordness, R. (1996). Effects of chemical pretreatment on posttraumatic cortical edema in the rat. The American journal of emergency medicine, 14(1), 27-32. 13. Appelberg, K. S., Hovda, D. A., & Prins, M. L. (2009). The effects of a ketogenic diet on behavioral outcome after controlled cortical impact injury in the juvenile and adult rat. Journal of neurotrauma, 26(4), 497-506. 14. Davis, L. M., Pauly, J. R., Readnower, R. D., Rho, J. M., & Sullivan, P. G. (2008). Fasting is neuroprotective following traumatic brain injury. Journal of neuroscience research, 86(8), 1812-1822. Curious as to any benefit to someone suffering years after a TBI ? Any research ? Please publish a follow up article ! The research is still coming out but we will be sure to continue to publish work! Currently there is not much research in humans. Yet! Can we conclude that exogenous ketones would benefit all of these populations as well? Which populations are you referring to? I have been “keto” for nearly 2 months, and have a TBI. I have felt/experienced mental clarity while at work as an occupational therapist, and I do not freak out if I miss a dose of stimulant for attention and initiation of tasks as I used to.